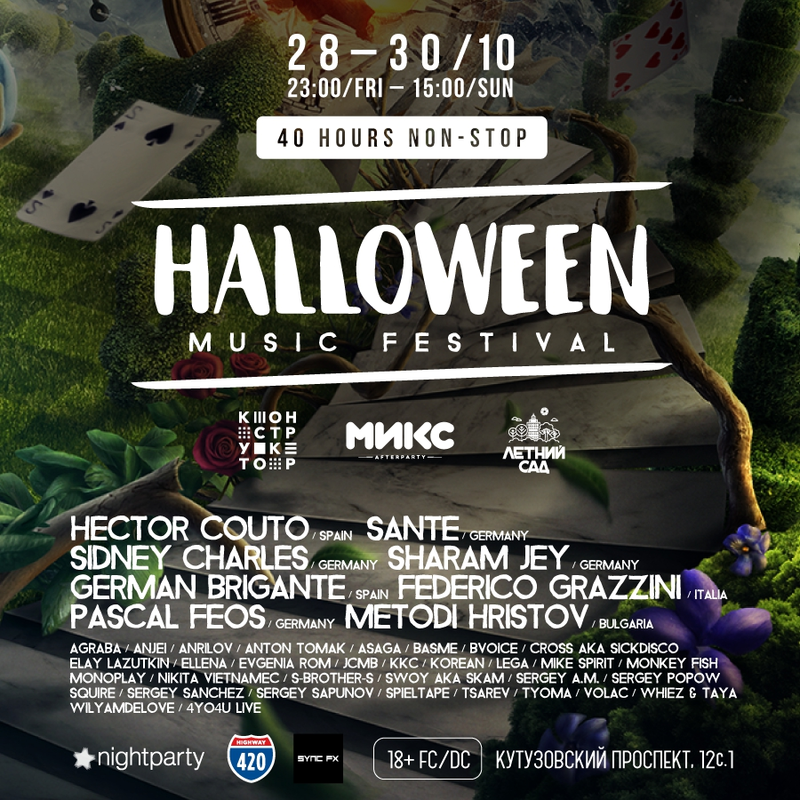 The annual Halloween music festival gathers three spots situated at Badaev factory: MIX, Constructor, Summer Garden – as well as electronic music, light and visual effects, Halloween costumes and performers from all over the world. This year theme is Alice in Wonderland: hide yourself behind the masks of Cheshire Cat, Mad Hatter, White Rabbit and other characters. The party will continue for 40 (!) hours. The organizers promise you’ll get into the space-time continuum where it’s possible to lose the connection to reality for a while. Feel the continuity of time while the best musicians create their magic: Hector Couto (Spain), Sante (Germany), Sidney Charles (Germany), Sharam Jey (Germany), German Brigante (Spain), Federico Grazzini (Italia), Pascal FEOS (Germany), Metodi Hristov (Bulgaria). Russian delegation won’t disappoint you either: there will be Ellena, VOLAC, Asaga, Spieltape, Wilyamdelove, and many others. Summer Garden will be used to come to senses: enjoy warm chill-out zone equipped with sound and visual performance. The price for tickets starts from 800 rubles (https://ponominalu.ru/event/halloween-music-festival), number for table reservation: 8 (495) 748-61-99.